Thank you very much for visiting and for your interest in my music. Nevada City, CA was inspired by an autumn walk through a beautiful Northern California town. This piece is completely free. Please download, enjoy and share. 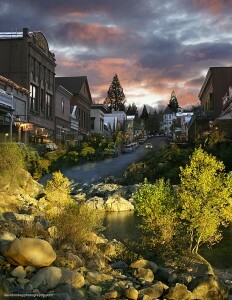 Photo: My Dream Town © DavidMcKayPhotography.com Inspirational images for Peace and Harmony. Please right click here, and select “Save link as…” to download Nevada City, CA. Click here for more free music! Such a wonderful piece of music which served to calm my holiday nerves! Will play in my art classroom to calm the students. Hi Carol – thank you so much for listening and for your comment. If you get a free moment, I’d love to hear how your class went. Thanks again.